. . . the author has fun with words. . . . It is no surprise that a late poem suggests the poet draws inspiration from Seamus Heaney, Emily Dickinson and Robert Hass. They would welcome him as a brother on the road. Biblical characters, including Jesus, are modernized and portrayed very humanly in the poetry book by Benedictine monk, Kilian McDonnell. Those who know the Bible and want another view of its characters, as well as other faithful people, may appreciate this work. God's 'desperate love' strides through McDonnell's work; reading it becomes another reason to get up in the morning. McDonnell has heard the Scripture's female voice and, like a faithful scribe, responded 'Here am I' by writing down her intimacies. You'll love the sweet nectar in these poems, their earthy details, the humanness of the women and men who inhabit their rooms. You'll want to sit at Levi's table for his feast, and by the power in McDonnell's words and images, you can. 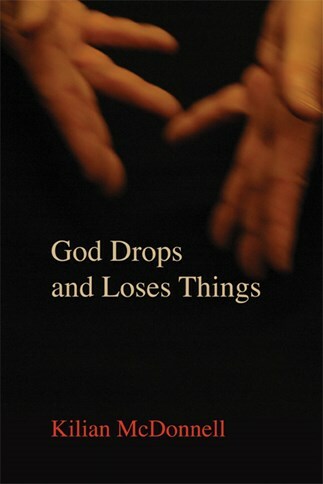 If you've ever wondered what the experts mean when they say that the Bible in so many ways is about you, the title poem in Benedictine Father Kilian McDonnell's God Drops and Loses Things should clarify the matter completely-even more so if you happen to be a parent. This is religious poetry in its highest form.